How nonprofits can get started with mobile from JD Lasica on Vimeo. This is part two of a two-part series on how organizations can use mobile tech for social good. See part one: A beginner’s guide to mobile fundraising. With the explosion of mobile giving in the wake of this year’s humanitarian relief efforts in Haiti and the Gulf Coast, nonprofits and social change organizations are now taking a new look at what mobile might be able to do for their own causes. Nicola Wells, regional field director for the Center for Community Change’s Fair Immigration Reform Movement, offers nonprofits a half dozen tips about how to get started with mobile and create an effective mobile campaign, whether for fundraising, recruiting or other goals. The 11-minute interview was conducted just after we presented the Mobilize Your Cause bootcamp at City University of New York as part of Personal Democracy Forum. The Fair Immigration Reform Movement is a national coalition of immigrants rights groups whose work in social media has three goals: to build a list of individuals who can be called upon when needed to press for immigration reform legislation; to communicate important news and information to those individuals as the campaign evolves, and to engage those supporters and build a relationship with them. Nicola noted that immigrants and people of color tend to use mobile more than the general population, and a lot of FIRM’s supporters did not have computers and did not belong to Web-based communities like Care2 or Change.org. Thus, mobile was the perfect tool for keeping in touch with them. Wading into the mobile space should not be done lightly, however. “It really takes a lot of staff time just to set up the mobile piece: to create the messaging, do the copy editing and to deal with the day-to-day functioning of the list,” she says. When the mobile initiative got underway, the executive team had to make sure they had staffing in place and in alignment, including having a key manager of the social media team involved in the mobile campaign. Next, they dedicated to the team a tech expert who was familiar with mobile campaigns and brought in Mobile Commons — a text messaging platform for mobile marketing — to handle the back end. You really have to put your short code and mobile information everywhere you put your url. Person to person is the best way to sign people up, not through email. Once you have a short code, try not to change it, because you’re building a brand around your code and number. For example, FIRM uses the short code JUSTICE (Justicia in Spanish) texted to 69866. This is the first of a two-part series on how organizations can use mobile tech for social good. See part two: How nonprofits can get started with mobile. 2010 will go down as the year nonprofits began to understand the potential of mobile giving. From the Haiti earthquake to the Gulf oil spill to relief efforts in Pakistan and Chile, social change organizations have begun to harness the power of mobile for a wide array of causes. Most famously, the American Red Cross’s Text Haiti campaign raised $32 million in the month after the devastating earthquake that hit Haiti in January — about 10 percent of its donations came through mobile. In texting, the response rate for getting people to call a decision maker on the organization’s behalf is 4.9 percent — 6 times the email response rate. That level of giving dwarfs the figure of $4 million for all mobile donations — for all causes — in 2009. Still, it’s worth remembering that few organizations have the ability to galvanize support on a scale similar to the Red Cross and its Haiti efforts. With tens millions of people now routinely using text messaging features — young people, especially, are in love with texting — the time is ripe for nonprofits to understand how they can use mobile fundraising not as a silver bullet but as one element of a broader strategy. Here’s a short primer on how mobile donations and campaigns work, with an emphasis on mobile fundraising. text replies asking people to text in slogan ideas, request more information, etc. If you’re considering launching a mobile fundraising effort, you’ll want to start off by conducting some research. Start by watching our interview with Nicola Wells of Fair Immigration Reform Movement, which does a masterful job with mobile, and read our primer on How to set up an SMS campaign system. More than 80 percent of text message users come from email lists. Growth rate is about 49.5 percent, though churn (turnover) is at 31 percent.. The response rate for text messaging where people are asked to make a call to a decision maker on the organization’s behalf is 4.9 percent. That is six times the rate of emails requesting recipients to call in. One example: The Human Rights Campaign used text messaging in an innovative campaign in which they asked supporters to text back the word “shop” and the name of a company, and the organization sent back a score from their Corporate Equality Index, telling them how supportive of lesbian/bisexual/gay/transsexual issues the company was. And Keep a Child Alive, with a push from Alicia Keyes, generated more than 90,000 new donors through its Text ALIVE Challenge (PDF). You decide to donate to a cause with your mobile device. In the United States, you’re permitted to donate only $5 or $10 at a time. The amount is determined by the organization running the campaign, not by the donor. In the years ahead, expect some flexibility to enter the equation. You use the SMS (short message service) application on your phone to text a keyword — such as HAITI, DOLPHIN, etc. — to a a five- or six-digit number called a short code. The organization involved determines both the keyword and the short code, and the short code cannot be used to send non-fundraising communications. You’ll then receive an automated response on your device from the organization, typically asking you to confirm your donation with a YES or OK.
Next, you’ll receive an automated confirmation text message, typically thanking you for your gift and pointing to a website with additional information or letting you opt in to text message updates on the campaign. • As your organization builds up its mobile list, you’ll have only limited direct information about the donor — essentially, the telephone number. You can use it to send a follow-up text messages to a donor asking for more information — most often, an email address — or to ask the donor to opt into other text message campaigns. • A donor must be allowed to opt out of further communications by replying to a message with the single word STOP or NO. • Because of the mechanics of mobile transactions, it may take up to 90 days before the nonprofit receives the donation. • At $5 or $10 a clip, mobile giving is a far cry from “the $71 average donation seen across the nonprofit sector in response to email solicitations, according to the Nonprofit Text Messaging Benchmarks study. We’ve just released a new report, Nonprofit Text Messaging Benchmark Study, that offers the first-ever look at how organizations in the United States are using text messaging and how subscribers are responding. It shows that mobile phones are becoming increasingly popular as an advocacy and fund-raising tool by organizations, and it provides benchmarks and metrics by which nonprofit organizations can measure their success with text messaging. Co-authored by myself and Michael Amoruso and Jessica Bosanko of M+R Strategic Services, the free report also illustrates the various ways in which organizations are using text messaging. The study was sponsored by Mobile Commons and mGive. 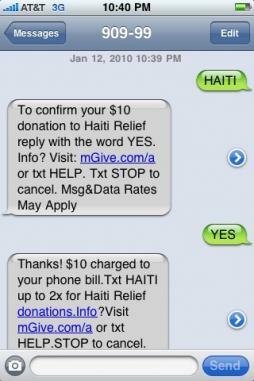 The earthquakes in Haiti earlier this year showed the power of SMS as a tool for fund-raising (raising millions in just a few days), and it’s now clear that there’s an opportunity for nonprofits to tap into the mobile market to engage their supporters. As the study reports, there are currently over 276 million wireless users in the U.S., and during the first half of 2009, users sent about 740 billion text messages. The report breaks down not only how nonprofits can use SMS to interact with supporters but also releases statistics on how specific organizations fared with their SMS campaigns. Mobile social marketing works in increasing awareness and moving people to actions. It is also becoming an effective way to engage users and constituents. Throughout our experience with mobile campaigns, we’ve run into the some great campaigns and some failures as well. In our ongoing series of articles and case studies on using mobiles for advocating for an issue and engaging a constituency, here are our top ten things that nonprofits should and shouldn’t do when running a mobile advocacy campaign. 1. Mobile messaging should be about interaction, not just pitch — a hard notion to learn for advocacy organizations used to pushing email messages by the millions. Mobiles offer a unique opportunity for interacting with a constituent. Advocacy organizations need to think about mobile marketing as a conversation, a way to talk two-ways with constituents. 2. Trust is key as the mobile medium is so very personal. Gain permission and offer relevant and timely content that is valuable to the recipient. Note how to opt out regularly and never ever spam. 3. Pull people to mobile interaction through other media — ads, billboards, the web and offer, in turn, mobile interaction with those media. Think of mobile as an acquisition tool. 4. Know your constituency. Be careful when targeting your demographics and make your ask accordingly — asking an older constituency to upload mobile photos is not going to be very successful. 5. Be relevant. Offer timely news and functional updates that are of interest to your audience — and be clever. Just by way of an idea: The American Lung Association could offer air quality updates via sms for where I live. If engaged in a campaign where I am signing a mobile petition, for example, let me know how it’s going — how many signatures have been gathered, for example. Remind me of events I have signed up for or activities that are part of an organization’s campaign. Give me information I want and need just-in-time when I need it. Mobile advocacy efforts are just beginning around the world. What are we learning from these emergent campaigns what works and what does not in using mobile phones to advance a cause or an issue? Of course, we think that advocacy organizations should start to pay serious attention to using mobiles in their work. There is increasing evidence that mobile social marketing works in increasing brand awareness and moving people to actions. It is also becming an increasingly effective way to engage users and constituents. Here are a few pointers from what we have learned to date. 1. What’s happening in the mobile (social) marketing market that advocacy organizations should pay attention to? Over 84 percent of Americans have cell phones, according to the CTIA, an industry group. Data shows that the majority of users carry their mobiles around for up to 18 hours/day. In fact the mobile, keys, and wallets are the three things most adults will not leave the house without. Mobile marketers are salivating, with polls, contests, coupons, and even mobi-sodes, short sms serial stories hitting the commercial market. Pepsi, Ford, Toyota, Burger King all have mobile campaigns, and more and more marketers are allocating hard dollars to “mobile marketing” budgets. Visa announced its mobile payment platform, allowing cardholders to use their mobile phones to make purchases or conduct other transactions by tapping them against readers. Think ‘just in time’ fundraising. • Telecom carriers: All mobile traffic is routed through telecom providers like Verizon, T-Mobile, and AT&T. • Handset manufacturers: A wide variety of companies manufacture mobile devices, from Apple’s iPhone to boutique brands you haven’t heard of yet. • The Internet: A small number of mobile hones (about 5%) have web capability – users can check email and surf the web, though the experience can be uneven at times. • Application providers: Mobile application providers allow you to create and manage your mobile programs, often from a web-based application. We’ll mention a few pertinent facts about each of these areas, but we’ll focus mostly on application providers; good providers will serve as a one-stop shop, so you won’t have to deal with any complexity. First, though, a short introduction to the various forms mobile programs can take.